Personifying the Space Age, guest will marvel at a look that was popular during the 1950s and first appeared in Tomorrowland in 1959. Shiny spheres and metallic and mechanical touches gives the feeling of otherworldliness through this area of the park’s bizarre architecture. 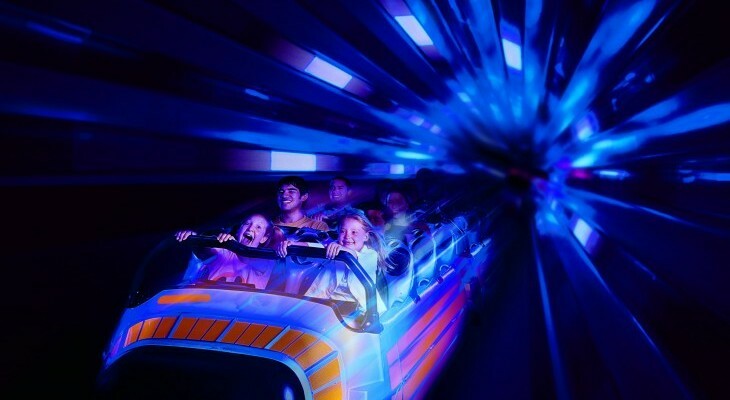 Blast to the outer reaches of the universe on Space Mountain. 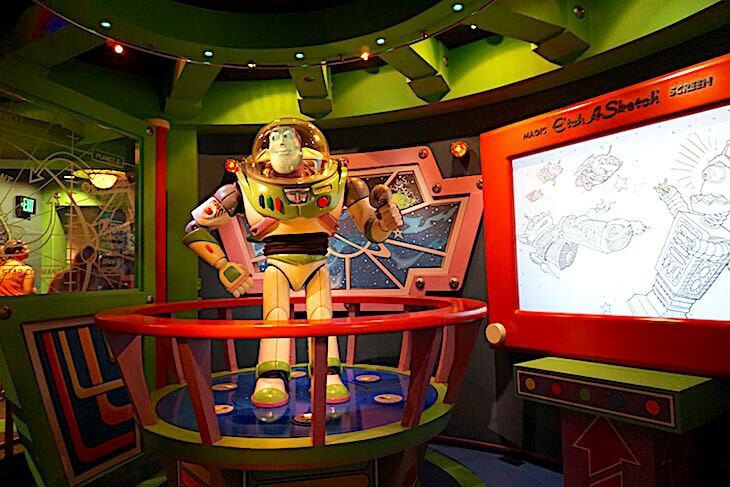 Get recruited as a Space Ranger to thwart the Evil Emperor Zurg on Buzz Lightyear Astro Blasters. 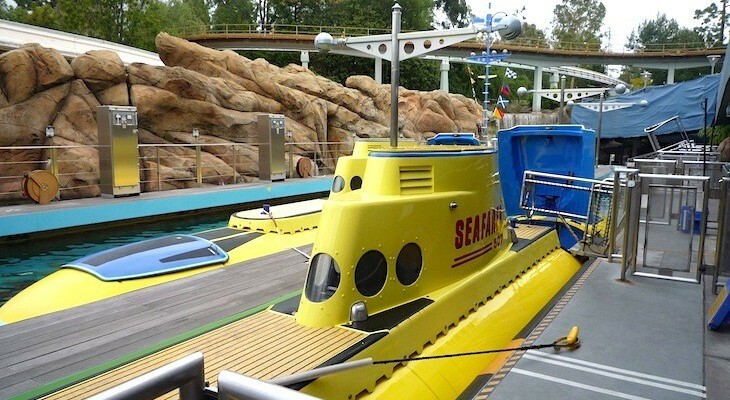 Embark under the sea on the Finding Nemo Submarine Voyage. And hope the “force is with you” on Star Tours—The Adventures Continue. 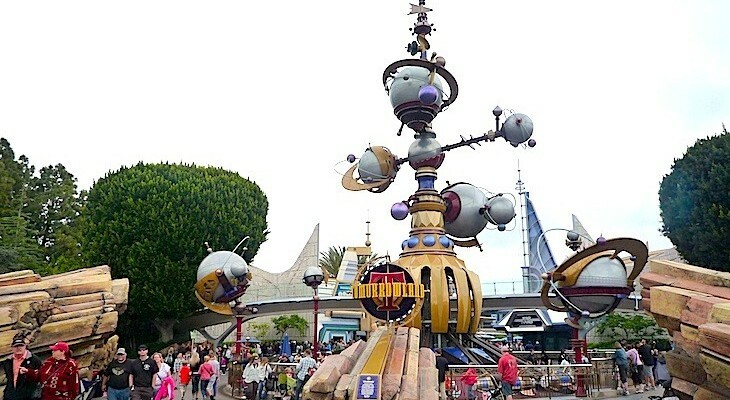 It’s totally space-age fun! The sound system here is amazing! 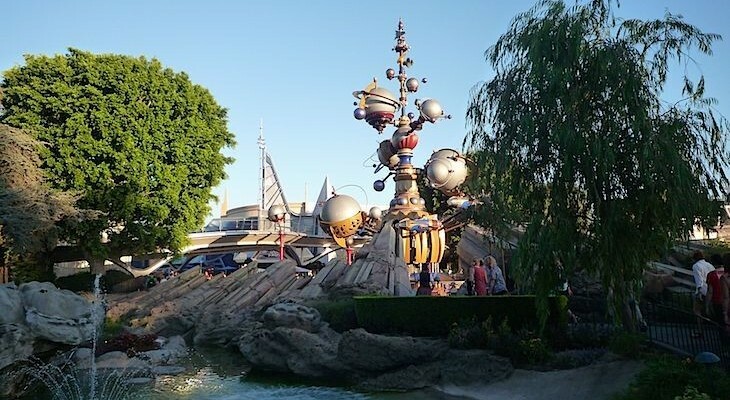 The 180-foot, conical-shaped “mountain” in Tomorrowland is one of the most popular attractions in the park, a cosmic roller coaster shooting through the darkest depths of the solar system. 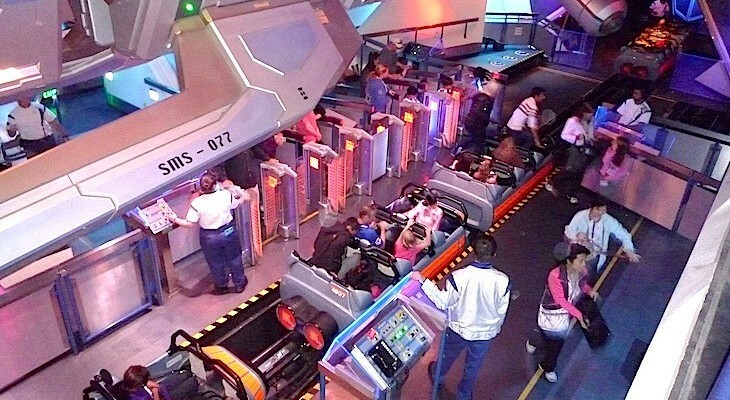 Sit two across on shuttle transporters and blast into orbit, plunging through a dark interior of sparkling comets, shooting stars, and glowing planets. Moving along at only 28 miles per hour you encounter only small drops and no loops or twists; it’s just the darkness and the addition of an amazing onboard sound system that makes it such a thrill. Minimum height 40 inches (3 feet, 4 inches). Not recommended for expectant mothers, those with back or neck problems, or those prone to motion sickness. FASTPASS. 3-minute ride. 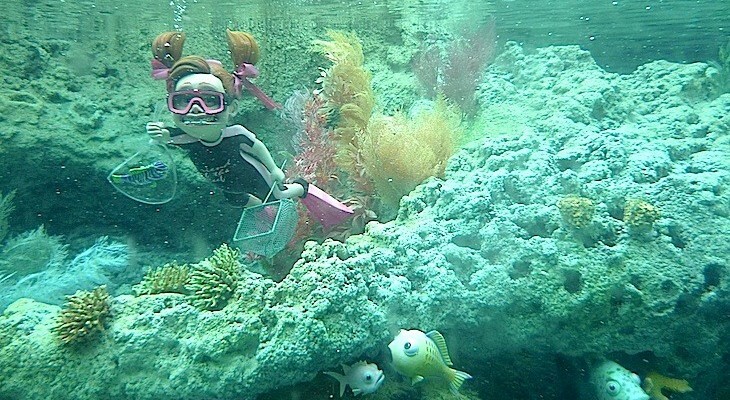 Just when you think a Disney attraction is so outdated it’s too far gone, they up and make it more fun than ever. Pick up a pair of 3-D glasses before boarding your interstellar space vehicle flight simulator from the Star Tours spaceport. Unfortunately your launch isn’t going to be a standard one; this go-round C-3PO inadvertently is your pilot on a wild voyage through the depths of the galaxy. Hang tight as he navigates you through jagged rocks on Tatooine, maneuvers around AT-AT’s in a crazy battle on the icy planet of Hoth, hyperspaces to Naboo, and flees inside the Death Star in an attempt to escape Darth Vader. All this before nearly crash landing back in the hanger bay! And believe it or not, this is only one of over fifty scenarios, each with different storylines. So ride again and again if you would like to attempt to experience them all. This is certainly one instance that you had better hope the “Force” is with you. Minimum height 40 inches (3 feet, 4 inches). 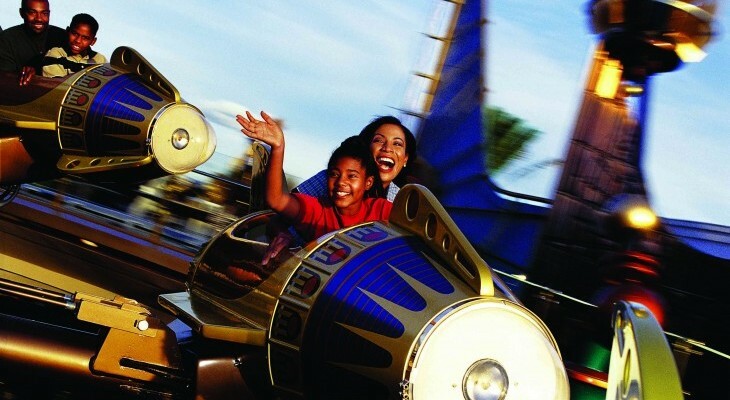 Not recommended for expectant mothers; those with back, heart, or neck problems; or those prone to motion sickness. FASTPASS. 5-minute ride.